This is another Yule Log.com exclusive: I have announced the upcoming 2014 Real Gone Music Christmas CD releases in my "Chip's Tips" Edition #14: Click Here. There have been a number of Christmas CDs released by Rosemary Clooney titled something resembling White Christmas over the years. First up is a twofer of Red Garters/Irving Berlin's White Christmas from Collectables Records/Oldies.com. Next, there's Songs From White Christmas And Other Yuletide Favorites, a Sony/Legacy (?) compilation, and finally there's White Christmas. All of these CDs are still in print, as far as I can tell. I wonder which, if any, are being reissued on Real Gone Music? This one's a bit of a headscratcher for sure. Also, wasn't The Kingston Trio's The Last Month Of The Year previously reissued by Collectors' Choice Music? It's nice to see that album migrating over to Real Gone Music since I never picked up the previous reissue. Wasn't that originally a Capitol Records/EMI LP? If I remember correctly, with the mergers and consolidation of the music industry in recent years, you mentioned that licensing negotiations with Capitol Records/EMI were near impossible and Gordon had to limit his focus to Sony owned albums. Well, if The Last Month Of The Year is, indeed, a Capitol Records/EMI release, then there's a ray of hope that The Hollyridge Strings' Christmas Favorites might one day come back in print on Real Gone Music! A real Santa Salute to you, for the work liberating these classic discs over the years! The Rosemary Clooney CD is her 1954 Columbia Records 10" LP, White Christmas. However, this Real Gone Music CD release will be an expanded edition that will include seven bonus songs that Rosie did on radio shows. The other expanded offering is the Brothers Four CD; it will contain four bonus songs. As for the Kingston Trio album; yes, it is a Capitol Records LP and Gordon had indeed previously released it on CD with his prior company, Collectors' Choice Music. And because of this, it made it somewhat easier to secure from the notoriously difficult UMG (Universal Music Group). The other two properties that it is hoped can be renegotiated with UMG are the previously released Mantovani and Hollyridge Strings albums. By the way, notwithstanding the success with UMG regarding the Kingston Trio, the desire is still to focus on SME (Sony Music Entertainment) and WMG (Warner Music Group) properties. Thanks very much for the "Santa" salute. Chip, thanks for clarifying these forthcoming reissues for me! I, like many others here, can't thank you enough for your untiring work to get these long out of print albums back in print and reissued on CD! The veritable Santa's bag of releases from Real Gone Music may just be the best Christmas gift of all! I only wish I didn't pick up a few of them in their original incarnations (specifically, the Collectables twofer of the Rosemary Clooney album and a used copy of Robert Goulet's Wonderful World Of Christmas) somewhat recently. I will, of course, be buying all the Real Gone Christmas reissues and will continue to double dip and amass multiple copies of these albums just to show my support for the adventurous spirit of Gordon and Real Gone Music as well as you and your efforts. Thanks again, Chip. For everything! You're very welcome, Peter. It is a labor of love for me. I was lucky enough to order (most of) the new Real Gone Christmas CD's directly from Real Gone Music - and they arrived yesterday !!!! Thanks for the tip Chip ! I picked up the Robert Goulet, Frank DeVol, Williams Brothers, Brothers Four, Kingston Trio, and Rosemary Clooney CD's. I've been listening to the Goulet, Williams Brothers, and DeVol CD's so far -- and they sound outstanding !!!! And the liner notes are great as well. I highly recommend these CD's -- if anyone was on the fence about getting these, don't be !!! I also received the new updated 2CD Andy Williams "The Complete Christmas Recordings" set earlier this week -- the tracks from the "Red" album are now in proper order and a new "cleaner" version of "The Wind, The Sand And The Star" is on it -- this is a must have as well !!!! RichD - thanks for the heads up about the corrected Complete Andy Williams! I had been holding off on ordering it since last year until I knew the track order was fixed, so it's good to know it's available. For the record, I want to point out that it was not just the track sequence for the 1963 album that had to be corrected, but the 1965 album as well. As I pointed out last year, Sony provided the wrong sequencing information for the 1963 and 1965 albums to John Alexander (the original producer of the project). Unfortunately, Sony's track sequence came from a previously released Andy Williams compilation that they had issued for Reader's Digest. But now, as Gordon promised last year, the Real Gone CD release has been corrected and now has the correct original track sequences. Dear Get2Me: The superb Hollyridge Strings Christmas CD was released a few years ago by RealGone or its predecessor and is even more spectacular tha the original LP in terms of fidelity. Gordon released the Hollyridge Strings Christmas CD with his old company CCM (Collectors' Choice Music) in 2008. He hopes to release it again with his new company, Real Gone Music. But unfortunately, though, it is now the property of UMG (Universal Music Group). So it will be a tough go. Yes, John, I'm well aware! I own, and thoroughly enjoy, two Collectors' Choice Music CD copies and two original Capitol Records LP copies of Christmas Favorites! Can you tell I L-O-V-E this album? IF Gordon is ever able to reissue it on Real Gone Music, I of course will buy more copies. It was out of print for far too long and I never want to be without Christmas Favorites by The Hollyridge Strings come Christmastime. Get2Me: we must think alike - I bought two copies of the Hollyridge Strings CD when it was released and gave the 2nd copy as a gift to a Percy Faith Fan friend of mine. In the '60s and '70s Christmases of my smalltown Midwest childhood, the mainly vocal anthologies that my Mom favored (the Goodyears, etc.) were the main soundtrack. I think that this double lp that included the Hollyridge folks was our first all-Instrumental album, and though Mom took a while to readjust her tastes, it became a standard part of the holiday rotation! wich2 - if you don't mind, would you care to list the song titles from your LP? Or you could PM me if you get a chance. I found that pic online - my Mom's stuff is at her place in Ohio. You might be able to find the list somewhere else on the web? Thanks for the track listing Chip! What year was this 2LP set released ? It was released and available to Capitol Record Club members in 1968. 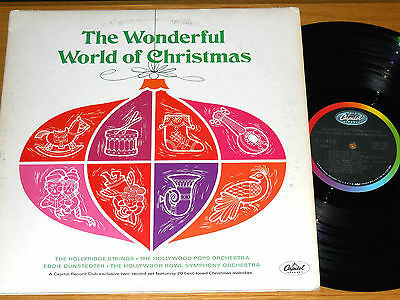 Finally got around to listening to Frank DeVol & the Rainbow Strings: The Old Sweet Songs Of Christmas on the big stereo this weekend while trimming the tree, and all I can say is "wow" - the album sounds incredible. Really nice separation and sound field. It's been ages since I heard this one, but it all came rushing back in a hurry. This album will be in heavy rotation the rest of the season (and for years to come). Thanks for bringing this one back to life.